Hard drives are usually sturdier than motherboards but less robust than processors. They are more reliable than RAM but they may have a short life for several reasons. A hard drive in isolation is basically a storage device and it serves no other purpose but to store files, much like discs and memory cards. However, when a hard drive is used to house an operating system and it works all the time to support the functioning of every component of the system, directly or indirectly, the load is enormous. Hard disks can crash, they may get corrupt by virus, malware or spyware, hard disks can have bad sectors or they may have some hardware problem that would render them inaccessible. It is quite common to have an inaccessible hard drive for a myriad of reasons. While many problems are fixable, you do need access to your data. You cannot risk losing the data by formatting the hard drive, you may not be willing to let go off the hard drive for repairs while having no access to your files and you may or may not have entire backups of all the files or data on your hard drive. No matter what problem you have and why your data is inaccessible, you need data recovery from hard drive. That is where Boomerang Data Recovery comes in. 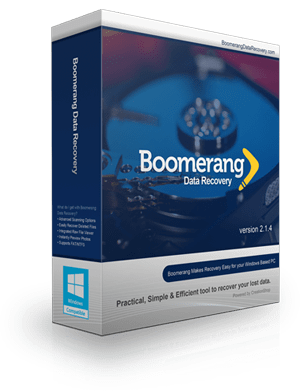 • Boomerang Data Recovery will help you to retrieve all the data from your hard drive without the component being sent for repairs. You would need to follow it up with necessary repair or diagnostic tests to reuse the hard drive if it not usable but you will retrieve your data. It so happens that inaccessible data on the hard drive is not exactly out of reach but there is some problem that is preventing the system from reading that data. The data is still there. You simply need a way to read or access that data and then retrieve it. This is what Boomerang Data Recovery will do. • Bad sectors and other hardware problems are common in hard drives. You cannot fix a bad sector using a software but you can recover all the data on either side of the bad sector or sectors that are diagnosed in the hard drive. Data recovery from hard drive has never been simpler or easier. A few steps of choosing the right options aboard the Boomerang Data Recovery and you would have your precious data retrieved and stored on your chosen device.